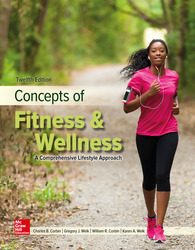 Concepts of Fitness and Wellness provides readers with the self-management skills necessary to adopt a healthy lifestyle. A pioneering text in the field, Concepts of Fitness and Wellness is designed to deliver a comprehensive text and digital program that continues to be at the cutting edge of physical activity and health promotion, empowering students to make positive steps towards developing a lifelong commitment to being active. The fully updated eleventh edition is supported by Connect, the only integrated digital learning environment that empowers students by continuously adapting to deliver precisely what they need, when they need it, so that your class time is more engaging and effective. McGraw-Hill Education’s Connect is sold separately and does not come automatically with the purchase of the textbook.